Do you dare sail the seas in search of adventure and booty? Pirates have captured the imaginations of many throughout the ages, and we are here to help you discover a new way to enjoy the colorful rogues of the sea. 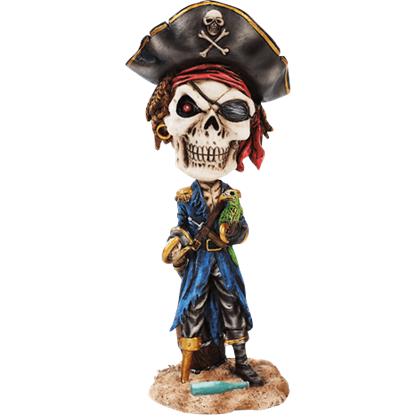 Offering a variety of intriguing pirate statues, we allow you to show off the scallywags and swashbucklers from the Golden Age of Piracy in your own home. 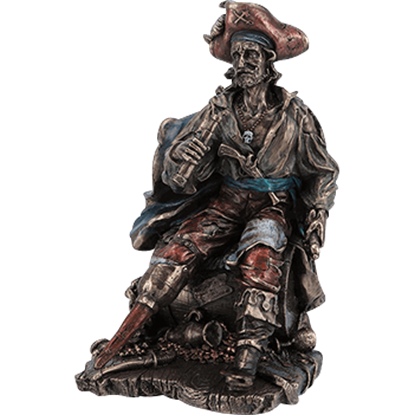 You will find excellent buccaneer statues of Calico Jack Rackham, Blackbeard, Sir Francis Drake, Mary Read, and Anne Bonny, among others. Be sure to check out our pirate treasure chest figurines, pirate candleholders, and pirate bobbleheads, as well. 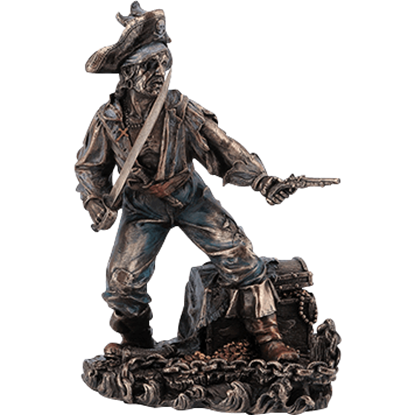 If you feel like you need a bit more pirate style in your daily life, you could not ask for a better way to get it than from the swashbuckler statues and pirate figurines in this category. Worn out from pillaging enemy ships from dawn to dusk and searching for buried treasure all night, this buccaneer sure is ready for a break! Give your desk or shelf a fun and nautical look with this Bronze Pirate on a Barrel Statue. In the business of pirating, you always have to be prepared to protect yourself, your crew, and most importantly, your treasure! This Bronze Pirate on Guard Statue shows a buccaneer who will do whatever it takes to defend his jewels. This lovely fairy is all done up to attend a masquerade ball. 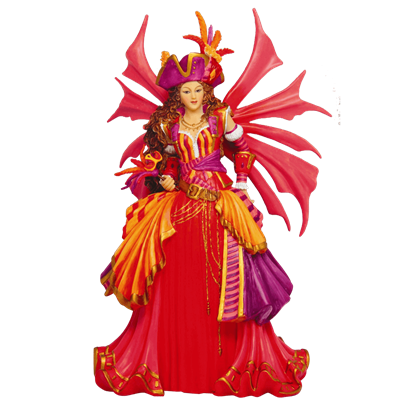 Her costume of choice is that of the iconic pirate, although this Colorful Pirate Faery Statue pulls off the look with far more elegance then a typical swashbuckler. If you are waiting for an opportune moment to celebrate your favorite character from the Pirates of the Caribbean series, this is it. 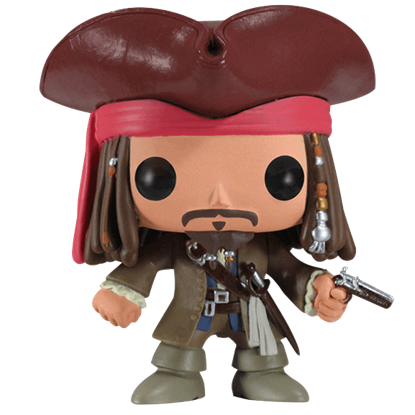 The Disney Captain Jack Sparrow POP Figure depicts the savvy pirate in chibi form. There should be a Captain in there somewhere! 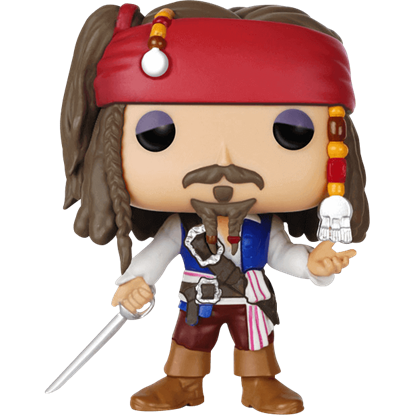 The Disney Jack Sparrow POP Figure offers a charming recreation of the shrewd swashbuckler with a penchant for rum for fans of the Pirates of the Caribbean films to enjoy. Show your love for beautiful statues and pirate fantasy with the Female Pirate Statue. Crafted from polystone, the detailing on this statue extends not just to the pirate, but to everything including the cannon at her side. Some pirates liked to show off their wealth, and this pirate is boasting his taste for the finer things even after his demise. 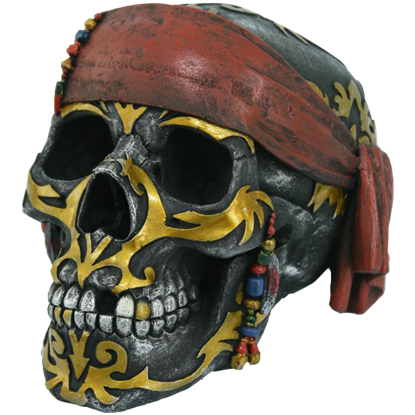 The Gold Tattoo Pirate Skull Statue depicts a weathered, dark grey skull covered in golden tribal designs. Something has caught our pirates eye, and they plan to draw their weapon to stake a claim on it. Our Lady Swashbuckler Statue features a female pirate clad in a swashbucklers outfit with her hand clutching the handle of her blade. 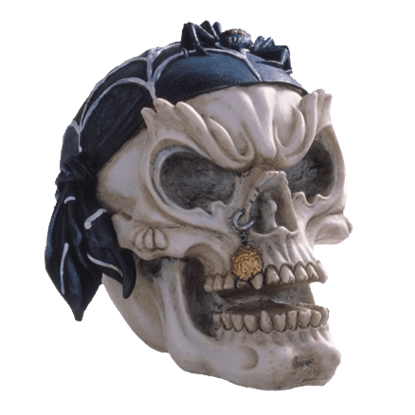 Every home needs a touch of pirate fun, and who better to implement into your decor than the sinister head honcho himself? 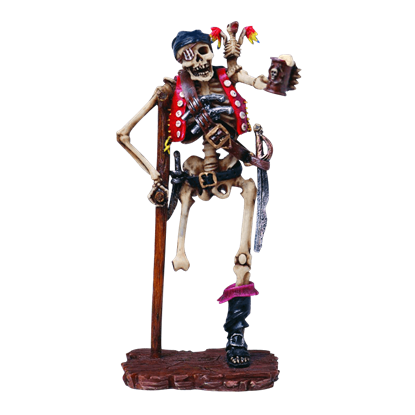 The Pirate Captain Skeleton Bobblehead will add a unique look and a ton of head-bobbling action to your decor. A captain who treats their crew with kindness will have their crews loyalty until the day that captain dies - and even after that. 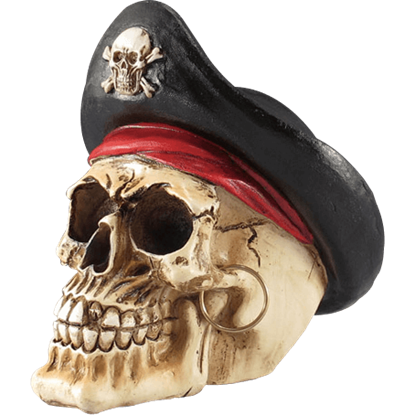 The Pirate Captain Skull Statue depicts one such late leaders head, treated with the respect it deserves.